New Cards by Jennifer Rodgers! 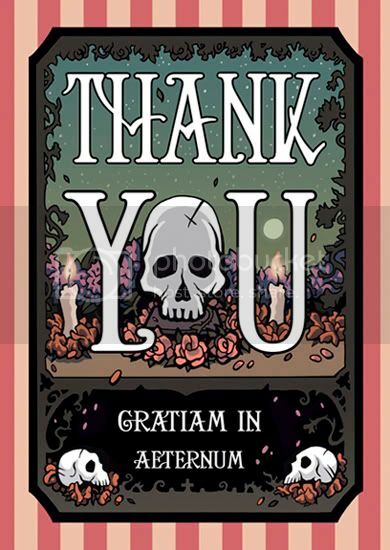 Jennifer Rodgers is adding a new “Thank You” card to her Greeting Card Shop, an elegant gothic design, featuring skulls, flowers and Latin. The cards will be in stock and available for sale by the 16th. Pre-Orders available now! You can find all of Jennifer’s cards at her Etsy shop:jenniferrodgersart.etsy.com. The current designs include birthday, valentine and holiday cards, all available as singles or in packs of five. When the “Thank You” card is made available, it will also be part of a variety pack, featuring one card of each of the current five designs. Jennifer will also be selling greeting cards at the DexCon gaming convention from Thursday July 17th through Sunday July 20th. For more details about the convention, visit the website. Jennifer Rodgers is an illustrator in gaming and comics. She has illustrated many RPG books including Mortal Coil by Galileo Games, Dictionary of Mu by Paka’s Thread Games and The Shadow of Yesterday by CRN Games. She is currently working on illustrations for Evil Hat’s Dresden Files RPG, coming soon. Visit www.jenniferrodgers.com. Read the Flames Rising Interview with Jennifer Rodgers for more information.